I was downstairs at the entrance of the stadium that is dedicated for the media men, journalists, photographers, and commentators, when Geofrrey Boycott walked in led by a Ten Sports staff member. He was supposed to lead Boycott to the commentary box, which he had no idea about and got lost - that led him back to the entrance I was at. There I got my first experience of hearing Geoffrey Boycott speak in person. Those of you who know him or have met him need no explanation about what he said to the man who had lost his way. That's when I interrupted and offered to lead him to the commentary box. It wasn't the poor guy's fault. If its your first time at the stadium, you can easily get lost, and the only reason I knew the way is because the commentary boxes are right next to the media centre, which I have been to an umpteen times during the last week. So there I was leading Boycott to his position. In the elevator, he introduced himself to me as Geoffrey. I humbly replied, "Yes Mr. Boycott, I know you. Who doesn't." You don't want to know what his reply was. Above, you see him being breifed on his schedule for the day by the Ten Sports team. He was kind enough to allow me a picture with himself, and as the photographer clicked us, Boycott said, "This is my cousin from Dubai. Good man." What a pleasant man! And it was a pleasure to meet him. As I walked back down to the entrance to guide more media men, there was Tony Greig sitting down with his son. 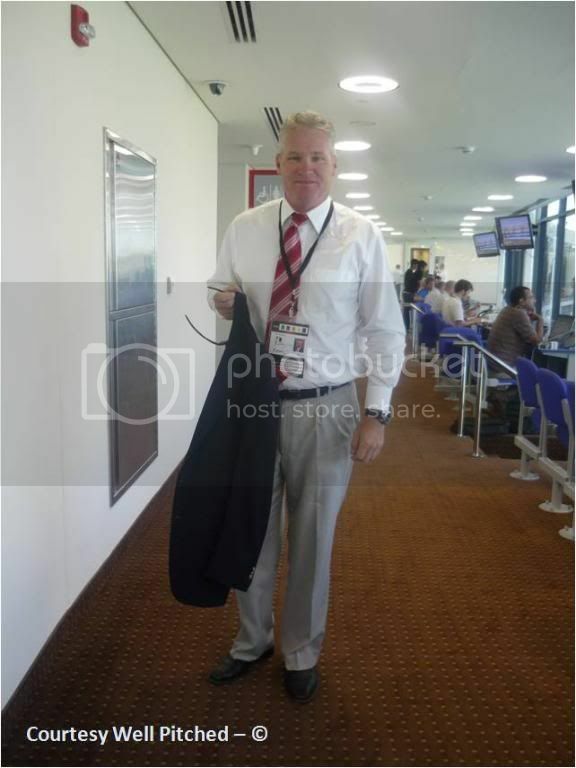 I had been in touch with Tony Greig over email regarding an article he was writing for the Dubai Sports City magazine, so he knew who I was when I introduced myself. He seems much more excited in the commentary box. In person he came across as very soft spoken and was also kind enough to stand up for a picture. I led him up to the commentary box as well. As the elevator arrived for my next trip down, put of the sliding door walked Rameez Raja, Waqar Younis, and Dean Jones. 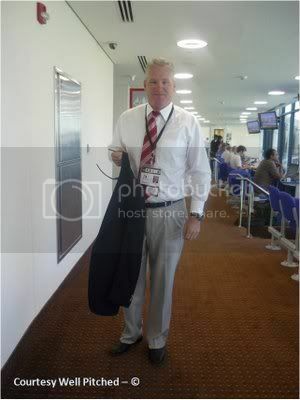 Later I managed to click Dean Jones while he walked through the media centre, where I am right now. The commentators are in the room right next to mine. And I really wasn't making all those trips down to guide the media men up - I had to go down for my smoke breaks. That's where I am going right now! Darn you and your secrecy. You're just dangling the bait on purpose. Tell us or something bad will happen to the stadium. I won't tell you what. 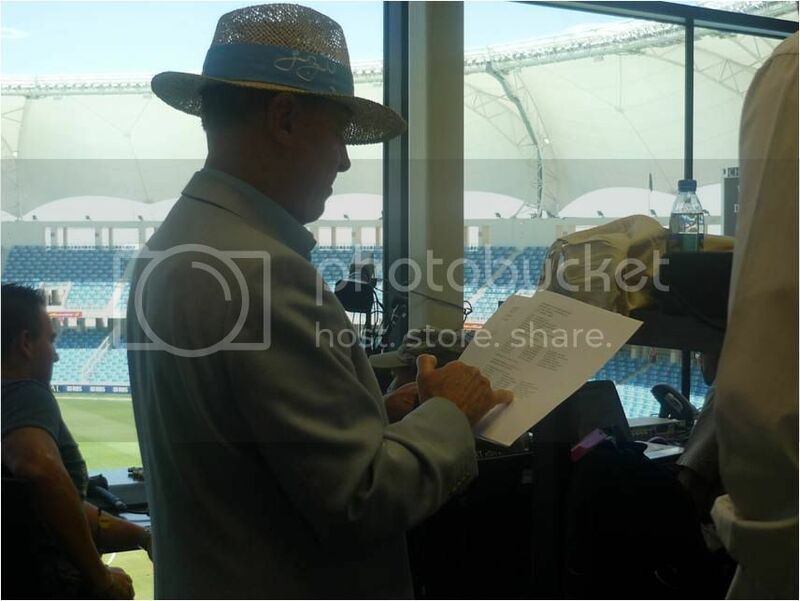 @Q: I did have the pleasure of spending some time with Geoff Boycott during one of the Sahara Cups. I got pretty lucky and spent most of the matches in the pavilion with the Pak team, and GB would pop his head in to give some "coaching advice" to Miandad. Also had lunch with him. Very interesting man. But most of the conversation was hogged by the ex PCB CEO (Mujib-ur-Rehman). Ugh! Lots of self-praise and bizarre visions for Pak cricket! you missed one member of the commentary team or atleast a media member, The ICL Girl! :P i forgot her name, it starts with an M i believe! is it me or is Dean Jones huge!?! i saw him outside the media room where we had met and requested him for a picture, the guy towered over me! @Sledge - Thats an interesting experience you had. I have lots of lowdown on Mujeeb ur Rehman..
And nope, Dean Jones did not call me a terrorist but Boycott did use that term, which I will mention in a bit right here..
@Anonymous - I'm not a professional photographer :-).. am happy with my 8 megapixel digital camera..
And yeah that's Arabic on Boycott's hat.. not sure what it says though. Haha.. NC there was nothing fake about Boycott.. he was true flesh and blood and giving it to everyone in sight! LIB - was great seeing you too man. You're right Dean Jones IS huge. 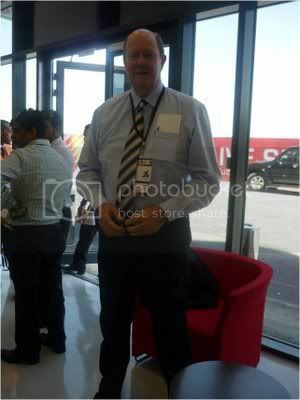 But not as tall as Tony Greig though.. he dwarfs everyone nearby. But that I knew, I didn't imagine Dean Jones would be this big. Man I spent the whole day at the stadium and I had no idea that Mayanti was there, till I got home and my brother told me! I didn't want to put it on the main post, but I can say it here I guess. So first when Boycott walked through the entrance the security guy asked for his accredited pass and while showing it he said, "Who do you think I am? A bloody terrorist?" The poor man who lost his way leading Boycott to the commentary box had to hear, "Why the bloody hell have they sent you to guide me. You lost the way to the stadium. Not you lose the way to the commentary box, what the f*ck are you doing here?" And his response to my statement that everyone knows him was "No they f*cking dont. The security thinks im a bloody terrorist. They think I walk around with bombs in my pockets. They have no f*cking clue who I am"